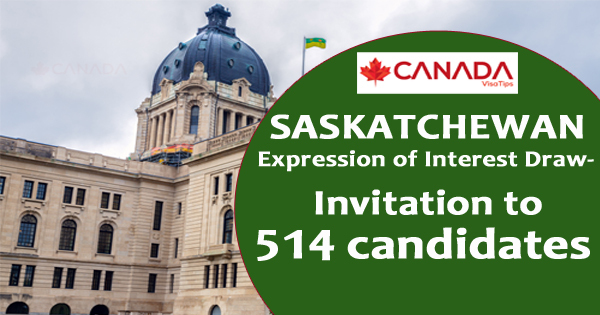 On November 23rd, the immigration authorities in Saskatchewan conducted a fresh Expression of Interest Draw and issued invitations to apply under two streams, to 514 candidates. Of these 247 were for Express Entry candidates, who had secured a minimum score of 63. 267 candidates received the invitation by using the Occupations In-Demand stream, where the candidates, had secured a minimum score of 64. All these candidates had had Educational Credential Assessments, which is a compulsory norm for applications in Saskatchewan. The province will also conduct at least one draw every month in the future. So far Saskatchewan has conducted six draws in the E.O.I. system. There was a draw, on November 1st where, 926 candidates received invitations to apply in the Occupations In-Demand as well as in EE streams. It is a record. ITA issued through regular draws. Candidates have 60 days to submit full application. Provincial officials assess applications to make a decision. Having e CLB language score of 4. Having completed one year of training/post-secondary education, or apprenticeship equivalent to the education system in Canada. One-year work experience in the last 10 years In a field of education/training occupation, and in a job in NOC A, B, 0 figuring on the in-demand occupation list. Obtaining proper licenses in Saskatchewan if the field requires it. Availability of settlement funds and settlement plan. Payment of $300 application fee online. Candidates of countries other than Canada, having a legal status in Canada, also can apply in this immigration category, but they must not be a refugee claimant. One year of work experience in the last three years (trades and non-trades). Having skilled occupation work experience in NOC A, B, 0 included on the in-demand occupation list. Moreover, Saskatchewan announced some changes in the In-Demand Occupation List, and has removed these ten jobs.